Price: USD$12.00 or 10 Euros plus postage from Arawasi website. Subscriptions also available. Advantages: Readable from cover to cover, interesting articles, good historic photographs, lots of colour profiles and some colour photos. 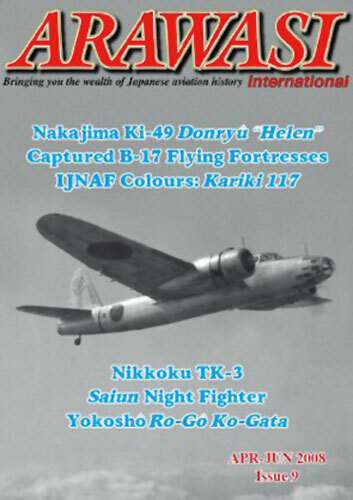 Arawasi International is a quarterly magazine, in this case April to June 2008, covering the history of Japanese Aviation from its inseption to the end of World War Two. The name Arawasi (Wild Eagle) was a Japanese name given to heroic pilots of any nation. By the beginning of WW II it was reserved for those heroic pilots of Japan only. The Magazine contains 10 articles, all in English, beginning with “the Dragon that lost its fire” on the Nakajima Ki-49 Bomber by Peter Starkings, illustrated by Mark Rolfe with many B&W period photos and two colour shots plus artwork for six examples. Next comes “True Colours: Kariki 117” by Watanabe Ryoichi and translated by Paul Thompson. This article, by kind permission of a Japanese website, details the “Paint Identification Standard for Naval Aircraft, Kariki 117” which was the Japanese Navy's equivilant to ANA Bulletin 157. This is a lead-in to a series on Japanese military colour schemes beginning in the next issue of Arawasi International. “(Re)Born Out of Necessity” by Martin Ferkl, Eleftheriou Geirge and illustrated by Martin Novotny covers the use as a Night Fighter of the Nakajima C6N1 Saiun (Iridescent Cloud) reconnaissance aircraft. “Japanese Fortresses, Made in the USA” by Peter Starkings on the captured B-17s is self explanatory. “From Art Deco to Bauhaus” by Mike Goodwin and illustrated by Zygmunt Szeremeta. An article on the Nippon Kokusai TK-3 Passenger Transport and Kokusai Ki-59 Army type 1 Transport. “Ro-Go Ko-Gata: Japan's Short Cut to Mass Production” by Paul Thompson and illustrated by Zygmunt Szeremeta. The beginnings of Japan's Aero Industry. “Wishing Upon a Star” by Eleftheriou-Domoto Kiri, translated by Paul Thompson and illustrated by Zygmunt Szeremeta. The first in an occasional series devoted to Japanese unit insignia which attempts to shed light on a particularly intriguing example. “Contrails”. A regular column of letters to the Editor. “Mreyama's Sprues and News” Plastic model 2008 released. Lastly, on the back cover, “On Location”. A visit to the National Museum of the Pacific War, Fredericksburg, USA by Paul Thompson and photos by Dr. Akiyama Fumihiko. You can read this magazine from cover to cover and there's always something of interest but especially so if you're into Japanese Aviation History.